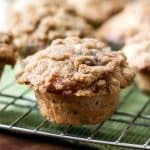 These bakery-style banana walnut muffins are of the extra-large variety with a sweet, buttery streusel and studded with chopped walnuts. They’re what you might order at a coffee shop, but better because they’re homemade (with a quick prep time) and you get the added bonus of filling your house with a warm aroma that you only get when you crank up the oven and bake something sweet. They’re a fall weekend must-bake. Preheat oven to 350°F and spray a standard-sized muffin tin liberally with cooking spray including the edges outside the muffin cups. In a large bowl stir together the mashed bananas, butter, egg, sugar, and vanilla until well combined. In a medium bowl, sift together the flour, baking soda, and salt. Add the dry ingredients to the wet ones and stir until just combined. Fold in the chopped nuts. In the same medium bowl, you used for the dry ingredients, stir together the brown sugar and flour for the topping. Using a pastry cutter (or clean hands) cut the cold butter into the sugar and flour until it the butter is incorporated (you shouldn’t have any chunks larger than pea-sized). Fill each muffin cup almost completely – the batter should reach to just below the rim. You should be able to fill 8 muffin cups this way. Fill the empty cups about 1/4 of the way with water. Divide the topping evenly across the muffins. Bake the muffins at 350°F for 20 to 30 minutes. Starting checking on them at 20 minutes and remove from the oven once they pass the toothpick test. Let them cool in the pan for a few minutes before transferring to a wire rack. You can freeze these and reheat in the microwave. The topping will lose its texture, but they still taste great even after being frozen.